Old cat behavior can be due to senility, technically called Feline Cognitive Dysfunction. Signs of kitty senility can be vague and confusing, and mimic other disease or behavior conditions such as feline separation anxiety or petting aggression. These kitties, usually over the age of fifteen, often develop litter box problems. In the past, these symptoms would have been brushed off as a normal part of aging, but feline cognitive dysfunction is a medical condition. Cats with cognitive dysfunction develop a starch-like waxy protein deposit (beta amyloid) in the brain. This affects pet cats in the same way that Alzheimer’s disease affects people. Sadly, cognitive dysfunction in our pets can’t be cured. Some cats can be helped, at least temporarily, with drug therapy. The drug selegiline hydrochloride (brand name Anipryl) is FDA-approved to treat cognitive dysfunction in dogs. Veterinary behaviorists Dr. Benjamin Hart, Dr. Kelly Moffat, Dr. Gary Landsberg, and others researched feline cognitive dysfunction and found that Anipryl also helped some cats suffering from feline senility. About a third of cats don’t benefit from the drug, but another third do show modest improvement in behavior problems. For instance, the cat may be able to remember how to find the food bowl, and stop yowling. For that final 30 percent of cats suffering from senility, the drug actually turns back the clock and dramatically reverses the symptoms. The cat’s appetite returns to normal, litter box mistakes resolve, and the cat once again recognizes their beloved owners. The improvement won’t last forever. Eventually, the drug will stop being effective and the cat will again develop kitty senility behavior signs. The added weeks, months, or maybe a year, though, offers owners great comfort and helps them come to terms with the eventual painful loss. Some folks who have never lived with a special cat might say, “Fifteen years is a good age,” but the rest of us know that it’s never long enough. The old saying, “use it or lose it” applies equally to pet brains. Studies of cognitive function in dogs proved that problem-solving activities like trick training and puzzle toys kept them sharp, connected to the world around them, and even extended their lifespan. Offer brain-stimulating entertainment. Place bird feeders and birdbaths outside windows for viewing pleasure. Provide cat trees with lots of hiding spots for kitty lounging, climbing, and exploring. Teach your cat to walk on a leash. Bribe food-motivated cats with tasty treats to learn tricks; for instance, call “Fluffy come!” then turn on the can opener, and when the cat runs to you, reward them with a treat. Offer puzzle toys that reward the cat’s interest by dispensing treats. This can mimic feline hunting behaviors and keep the cat entertained and mentally sharp. Rather than offering one big bowl of food, try hiding saucers of small amounts all over the house. Provide them with different levels so the cat must hunt for the food. We can’t know how long our special kitties will be with us. Once they reach senior years, and the time grows short, their companionship becomes even more precious. 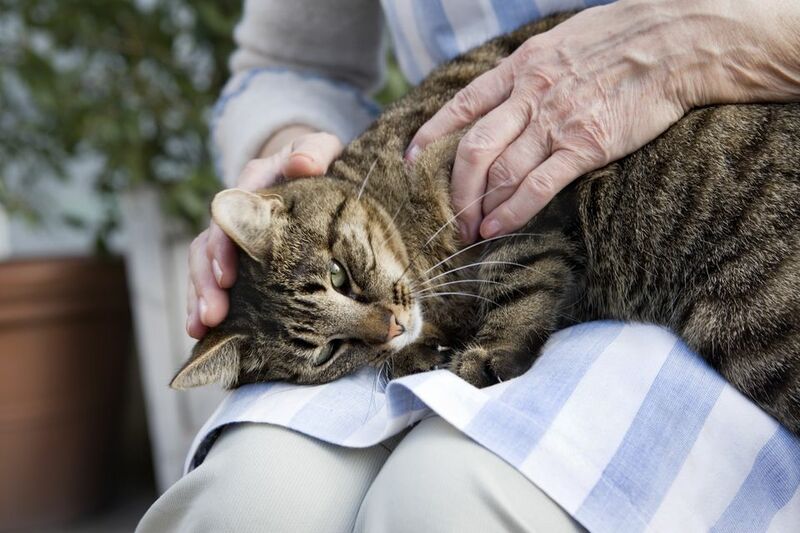 Providing for your cats' mental health as well as physical well-being helps keep them connected with life—and us—for as long as possible during their golden years.